There are three types of armor: heavy medium and light. Heavy armor gives more protection, but hampers stamina regeneration. When fighting groups of humans there could be archers with them. Focusing on one enemy will deplete his stamina (displayed as a yellow bar under his life bar), this will prevent him from blocking your attacks further. You have two types of dodge, a long one (which is a roll) and a short one (which is basically a sidestep/backstep). Adrenaline points are very important. They let you trigger several special effects, like casting signs using them instead of adrenaline. With perfect timing on arrow deflection you can actually send an arrow back to the one that shot it. Slotting skills let you link them to mutagens in order to increase their effect. Of course you can combine different trees, but you’ll need to experiment on what is best to fit your playstyle. If you focus your build on swordplay, you’ll have trouble casting many signs in combat. You can compensate with runes and adrenaline. Alchemy is a little more challenging and complex, but it’s very rewarding. If you slotted a rune in a sword, but you want to remove it, you can either destroy the sword and get the rune back, or destroy the rune and get the sword back to having an empty slot. Slotting a rune in a sword activates a visual particle effect on the blade. If you counter an enemy while holding higher ground than him, there’s a chance that he’ll fall. There are explosive barrels that can explode when set fire to. Alchemy recipes can be bought or looted. Every point spent into the signs tree increases you stamina regeneration. That means that if you max the signs tree you you’ll be able to spam spells. Places of power are monoliths you can find in the word and meditate at. They give you a buff and a skill point. Exploring you will let you build up faster and in a more flexible way. If you have enough sign power you have a chance to one-shot enemies. You can unlock a second form of each sign, which you can equip. The second form isn’t necessarily better. They’re situational. One version is cast by tapping the button, the other by holding it pressed. Your horse can have equipment as well, a trophy, saddlebags, a saddle and blinders. They all are visible on your horse. The saddlebags increase the weight limit you can carry, the saddle increases the horse’s stamina, the blinders increase the threshold at which your horse will panic. The level of difficulty are named: Just the Story, Story and Sword, Blood and Broken Bones and Death March. On higher difficulty levels meditation does not regenerate health. Geralt’s stats also don’t scale as well. 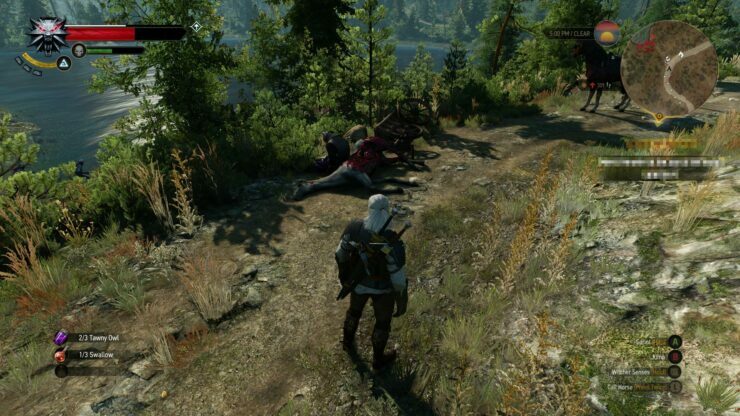 Witcher 2 will be very important in The Witcher 3. Toxicity fades over time. The alchemy skill tree actually plays on toxicity. Certain effects happen only when you’re intoxicated. When you upgrade armor, it will change visuals and look cooler. Eventually you’ll have to let go of a piece of armor, since you can upgrade only up to a point. 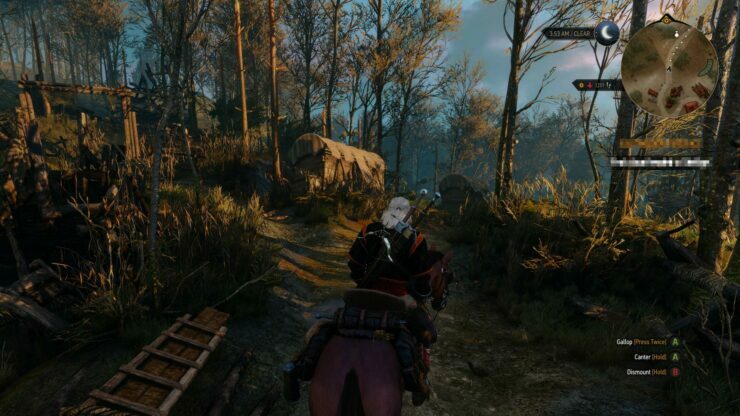 Geralt’s speed will be affected by terrain like swamps. He will be slowed down when going uphill. There are some quests that you can only accept or continue only during a certain time of day. Certain monsters also don’t return to their lair until a certain time. You cannot turn off blood, as CD Projekt is creating a mature game. Fist fighting has been reworked with the removal of quicktime events. You cannot get a new horse permanently. You can tame wild horses with the axii sign, and you can ride them, but they won’t be permanent. You can turn off health bars on enemies, but it will make the game harder, as the health bars flash when you can counterattack. That won’t happen if the health bar is invisible. Side quest choices can affect the main story. You can craft different bolts for your crossbow, exploding ones, bleeding ones, knockback ones and more. The crossbow is your main weapon underwater. You can also upgrade it and get new ones. You can threaten NPCs that are too rude to you, and they will run away in fear, but that might upset the guards in cities. If you get “killed” by a guard, you get knocked out and you lose part of your gold. You can finish the game without using ranged weapons. You don’t need to use a specific strategy.